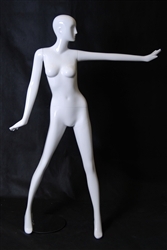 Our glossy white petite female mannequin will add poise and sophistication to any display. Standing in a straight on pose with her hands on her hips. Made of Fiberglass. Round metal base included.